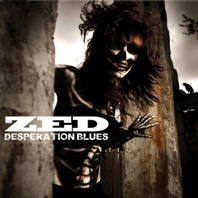 ZED’s Desperation Blues received honorable mention on No Clean Singing’s ‘The List To End All Lists’ for 2013, published on December 26th. The founders of this site — Islander, Alexis, and IntoTheDarkness — are three metalheads who live in the Seattle area. Over time, Alexis and IntoTheDarkness have become scarce as writers for NCS. We still go to shows together, and still swap music, but the writing chores have fallen to a new cadre of scribes. In addition to Islander, the regular writers are Andy Synn (a member of the metal band Bloodguard and a resident of Nottingham, England), BadWolf (who lives in Toledo; Ohio and also writes for Invisible Oranges under his real name); TheMadIsraeli (a guitarist and denizen of Tennessee); and DGR (who lives in Sacramento, CA and used to write for The Number of the Blog). We also feature contributions by a large group of guest writers. Thanks to Islander, Alexis, IntoTheDarkness and crew for the acknowledgement! Be sure to check out No Clean Singing – they’ve got a great site going.